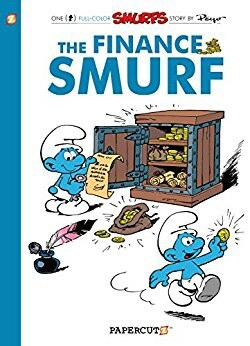 Everybody knows the Smurfs — Papa Smurf, Brainy Smurf, Jokey, Grouchy, Vanity, Lazy, Handy, Hefty, Baker, Farmer, Chef, Poet, Smurfette and so many more, but did you know there was a “Finance Smurf”? I want to share that story with you, specifically how, as a stay home dad, I could really identify with Smurfette. But first let me get my back story straight as you, the reader, have probably come here for the “becoming a product manager” bit. This is the story of my journey transitioning from a stay home dad to becoming / getting back into a product management role in the startup world. Originally, I had wanted to start writing before I even landed a job. While I was confident (or delusional enough) to think that I would be able to get a job, a good job, I think I still wasn’t courageous enough to start writing. So spoiler alert, yes I’ve (finally!) gotten a job. This ruins the suspense for you my reader, but it made me feel a hell lot safer. I think we can compromise and save the suspense for whether or not I can succeed as a PM and lead the startup to success. Anyway, there’s an expiration date on what I want to write — the feeling of failure being stuck at home, not knowing whether or not I still got it in me to work professionally, whether or not I can find a good job. Well, I got damned good one, and it’s starting tomorrow, and I’m already gaining some of my confidence back as I look at the things I can do! So I know I must write this down now before the feeling is lost. Who’s your favorite success story? 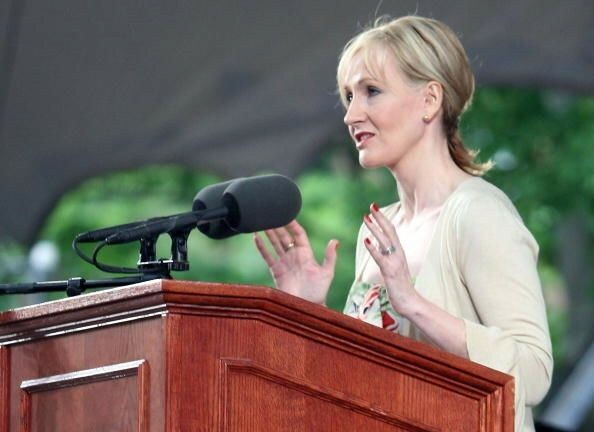 Mine is probably J.K. Rowling’s, her Harvard commencement speech was the epitome of a success story — born into poverty, divorced, a single mother, on the brink of homelessness, hit rock bottom but determined to bet it all on a single book she’s writing, and then… massive worldwide success! Who doesn’t love a story like that. We can’t help it. Our brain tricks us into thinking that our future will be bright, that we’ll also bask in the glory of success as people like J.K. Rowling and Steve Jobs had, or at the very least, things will get better, no matter how grim and hopeless our current situation is. My situation was no where near as bad as J.K. Rowling’s. The startup I had moved to Hong Kong to do failed, my wife wanted to stay to help at her parents’ business, so I took the responsibility as the primary care giver. I’ve been stuck in this stay home dad role for the past 7 years, been looked down upon by people around me, my parents, my wife’s parents, the relatives… etc, simply because I saw the importance of early childhood and decided to stay home for my kids. I should clarify, I love my kids! I love spending time with them! I know evidence from academic research had proven the importance of a warm, loving, engaging early-childhood. So on that front, I feel proud! I also feel guilty — I could’ve been a better dad, more forgiving, more unconditional love. Being a parent is tough, I had to learn to not be so tough on myself. Now, when I see how happy my kids are when they see me come home, when I see how much they love each other, I feel it has been well worth my sacrifice. But it is still a sacrifice. I never thought I would be stuck in full time dad duties forever though, because in my mind, I was already writing the triumphant story of my return to success! Our brains’ ability to create fantasy and delusion is actually kinda horrifying and dangerous. I knew about the danger of reminiscing in the past and dwelling in the fantasy of the future. I knew if I wanted to get back to do work, I had to set up some daily routines and put things into consistent, daily action. But, what about the “now”? Aren’t what I was doing now worth something? This brings us back to Smurfette and the story of Finance Smurf. 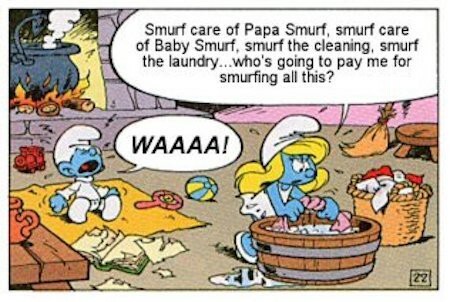 Smurfette smurf care the baby and Papa smurf and do all the chores but no one pays her for the work. Seriously, I could sooo empathize with Smurfette right there! These are important jobs but they don’t get paid. A Swedish friend of mine once said to me: “In Hong Kong, the young and the old are taken care of by Filipinos and Indonesians.” That’s the result of the hyper capitalistic system of Hong Kong. One time, our preschool received a “student”, little 18 months old boy, his emotional and language development was really weird, like his head was completely separated from his body. Both the mom and the dad are doctors, and we asked if there was any problems during the pregnancy, or any genetic disorder, nothing. Finally, we probed the domestic helper and found out that, basically, there was no interaction with the baby in his first year of life except for feeding and changing diapers!! (Do you know how serious a problem is this?) I felt so sorry for the child, and also for the parents. What is the point of life? What’s the point of success, if your children are ruined? 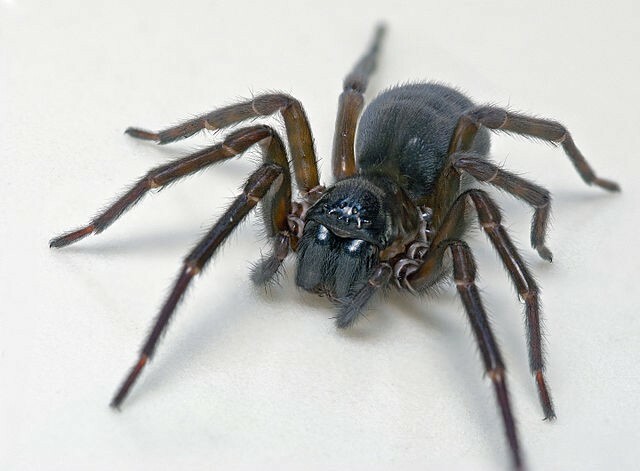 Swing it all the way one way and you completely sacrifice yourself for your offspring, swing it all the way the other way, you ruin any chance of your offspring to have a good life. What should we do? How should we live? I want to feel fulfilled — do “deep work”, earn a living; while also be present for my children. Product Management seems to have changed a lot in the last 7 years. When I joined LEGO CUUSOO in 2009, I didn’t even know my position was called “Product Management”! I’m super excited to get back in the game! This time, I’m not just going to create the product, I’m going to stick around and take it to the top! And I’m going to document my journey right here, so hit that “Follow” button if you wanna come along for the ride! Dad, Storyteller, @LEGO_CUUSOO product lead. Early @StartupWeekend facilitator. @AcceleratorHK alumni w/ 2 failed startups. @_EDiversity and @oya_labs now.